By now, most people are aware that former Phillies 1990's pitching ace Curt Schilling was recently suspended from his gig covering the Little League World Series for ESPN, and removed for a week from his Sunday Night Baseball broadcast on the network. What most are unaware of is the true reason: a "witch hunt" mentality which saw his actual actions distorted completely by the numerous people who dislike his outspokenness and his politics. Now the rest of this post is going to deal with difficult topics like "math" and "truth", so if you have a rough time with either of those, or prefer your "sports" in the tame realm of scores and trades and such, you might want to just move along. But if you genuinely care about why it is important that you NOT blindly follow the anti-Schillites, not allow yourself to take part in this partisan witch hunt, then please, read on. 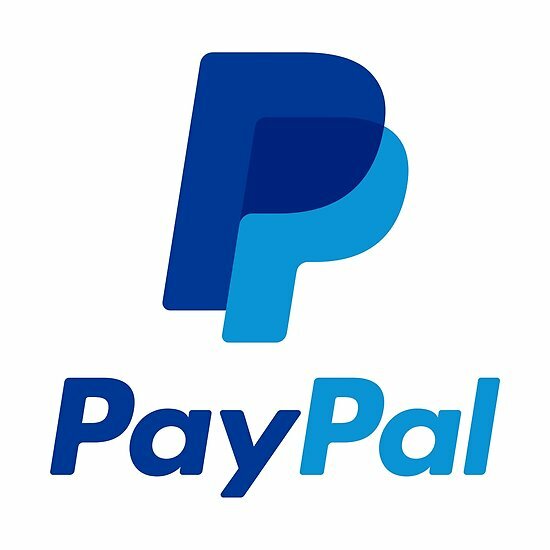 Let's first address what actually happened to cause the suspension. Schilling was accused of making, or more appropriately sharing, an "anti-Muslim" statement. He was further charged by some with comparing Muslims to Nazis. Some never actually state what it is specifically that he said or shared, just that whatever it was, was "offensive" in some way. There can be little question as to the positive impact that slugging 1st baseman Jim Thome had on the Philadelphia Phillies organization upon signing with the club as a free agent in the off-season prior to 2003. As he turns 45 years old today, middle-age in a normal lifespan, it's a nice time to take a look back. Thome was aggressively wooed by the organization following a dozen glorious seasons with the Cleveland Indians. During those years, Thome slugged 334 home runs, drove in 927, and earned every bit of his tremendous .287/.414/.567 slash line without a hint of PED involvement. He also had helped the Tribe move from antiquated Cleveland Municipal Stadium, jokingly known as the "Mistake by the Lake", into Jacobs Field, Cleveland's version of the new 'retro' ballparks that began springing up around MLB during the mid-90's. In their new digs, Thome and a bevy of young stars helped the Indians go from doormats to perhaps the most dangerous team in baseball, and to the verge of a World Series victory. He was a 3x AL All-Star, a Silver Slugger winner, and in his final two season's with the Tribe, finished 7th in the AL MVP voting. Thome was brought in to add veteran leadership and winning experience to the Phillies, to add legitimate pop to the middle of the batting order, and to help the team pack The Vet in it's final season and carry over excitement and a real chance at winning in the new Citizens Bank Park. The Phillies had begun to look like a contender over the previous two seasons. Under manager Larry Bowa, the 2001 team had battled Atlanta right into September. But the 2002 team disappointed, finishing just 80-81. It would prove the organizations only losing season between 2001-2011. The 2003 version of the Phillies included not only Thome, but also newcomer 3rd baseman David Bell, veteran holdovers Bobby Abreu and Mike Lieberthal, and young stars Jimmy Rollins and Pat Burrell. During the season, a 24-year old 2nd baseman named Chase Utley would join the squad, challenging and eventually unseating incumbent 2nd baseman Placido Polanco. Thome proved to be just what the doctor ordered, just what the organization paid for, as he bashed 47 home runs, just one shy of Mike Schmidt's franchise record at the time. He knocked in 131 runs, and in his first National League season finished 4th in the NL MVP race. The Phillies battled down to the season's final weeks for the NL Wildcard berth. But a late swoon left a bitter taste in the mouths of the players and fans. The Phils lost seven of their final eight games, including a crucial 3-game sweep at the hands of the Florida Marlins, finishing with an 86-76 record, 5 games behind the Fish, who would go on to win the World Series. At the end of that 2003 season, Thome helped the team close down Veteran's Stadium, their home since 1971. Schmidt himself raised Thome's arm as a sign that not only the slugger title, but the role of leader had been officially passed to the big man. Expected to contend in the 2004 season, the Phillies did indeed finish in 2nd place in the NL East. However, with another 86-76 record, they finished 10 games behind front-running Atlanta. More disappointing perhaps was that again they missed out on the Wildcard, finishing just six games behind the Houston Astros. Thome was again the centerpiece of the contending Phillies lineup that year, bashing 42 homers with 105 RBI. However, there was a growing situation in the organization. A 24-year old slugging 1st baseman named Ryan Howard was destroying the minor leagues to the tune of 46 homers and 131 RBI. Clearly now, Thome was blocking the future. As the 2005 season began, a now 34-year old Thome started slow, with just one homer through the month of April, followed by a 3-week stint on the Disabled List. He returned at the end of May, and played through June, before his injuries caught up to him and ended his season, and his Phillies career at that point. Thome would return to the team for a 2nd show, signing as a free agent again with the team in the 2011 off-season. The Phils had won 5 straight NL East crowns at the time, but Howard had been seriously injured at the disappointing end to those 2011 playoffs, and it was unknown if he would be ready to play when 2012 began. Thome was used mostly as a backup and pinch-hitter in April of 2012, spent the entire month of May back on the DL, but then returned in June and got hot. That hot streak, however, coincided with the team's collapse. The Phils opened June of 2012 just 2.5 games out of 1st place, and looked like they could again contend for a 6th straight division crown. But after winning on June 1st, the Phillies lost six straight, eight of nine, and 15 of 21. For the first time in years, it became obvious that they would not contend. On June 30th, the Phillies traded Thome to the Baltimore Orioles, ending his career in Philadelphia for a final time. In his nearly three full seasons in red pinstripes, Jim Thome became a beloved fan favorite. His #25 shirsey and jersey are still popular around the ballpark to this day. He helped the team move from the .500 level to the verge of contention, and from the old age of The Vet to the new age at The Bank. Now Thome moves into middle age, having retired following that brief stint with the Orioles at the end of 2012. For his career, Thome bashed 612 home runs. Cleveland, where he played for parts of 13 seasons, and where he is even more beloved than here, erected a statue in his honor. Thome has returned to Philly a number of times, most recently for last month's celebration of his ex-teammate Burrell becoming enshrined on the Phillies Wall of Fame. We can expect to see him back for similar reunions and events in the future. He will be eligible for Baseball Hall of Fame consideration in 2018. Thome should receive considerable support, and he could even become a 1st or 2nd ballot Hall of Famer. If that should happen, expect to see a strong contingent of Phillies fans show up wearing red at Cooperstown in the summer in which he is enshrined. Could Jesse Biddle Become a Phillies September Rotation Option? With the Phillies rapidly running out of time in the 'Dog Days' of August, a calendar change to the month of September could bring some changes to the starting pitching rotation as the team moves through the final five weeks of the 2015 season. To this point, 13 different pitchers have received at least one starting assignment in the Phillies rotation: Aaron Harang (22), Jerome Williams (21), Cole Hamels (20), Sean O'Sullivan (13), Adam Morgan (11), David Buchanan (10), Aaron Nola (7), Chad Billingsley (7), Severino Gonzalez (7), Kevin Correia (5), Jerad Eickhoff (2), Dustin McGowan (1), Phillippe Aumont (1). Many fans have grown weary of the sight of Harang and Williams parading out to the mound. The two journeymen are here for no other reason than to soak up innings. They are in no way connected to the hoped-for brighter future that everyone wants to see get underway sooner, rather than later. With the team having turned the page on the past with the trades of Chase Utley, Cole Hamels, and Jimmy Rollins since the end of 2014, not to mention both Jonathan Papelbon and Ben Revere, there is a growing impatience for that future. If nothing else, the appearance at Citizens Bank Park this week of the first place New York Mets and their vaunted young pitching rotation is a reminder of just how quickly the fortunes of a team can turn around when a strong group of arms is brought along to tame the opposition. The Phillies had a few good prospect arms already in their system, and with the draft and trade acquisitions of the last year, those options have grown into a legitimate stable of promising young hurlers. But how many of the youngsters might actually be ready to help in the big leagues, sooner rather than later? While fans, including me, would much rather see young, MLB-ready or near-ready arms such as 21-year olds Jake Thompson and Zach Eflin, or 23-year olds Alec Asher and Ben Lively, in the September rotation instead of Harang or Williams, the facts would not seem to make such a thing preferable. None of those pitchers is currently on the 40-man roster. In order to bring them up, the Phillies would need to drop someone from that roster. While it could be argued that they could drop Harang or Williams, or some other player such as Domonic Brown, and not be hurt, that simply is not likely. The bottom line on such a move is, as Phillies prospect expert Matt Winkelman pointed out last week, unnecessary. The facts are that this is a completely lost season, and the Phillies have enough healthy options on the current 25-man and 40-man rosters to finish out the season. However, when we examine that 40-man roster, it does include one intiguing name. 23-year old lefty Jesse Biddle was the Phillies 1st round pick in the 2010 MLB Amateur Draft, the 27th overall selection that year. In the five years since, Biddle's rise through the club's farm system has been in fits and starts. Without going through all the histrionics, let's bring him to the present. In 2015, Biddle has made 23 starts across two levels at AA and AAA. In 120.2 innings he has allowed 137 hits, and has an 87-59 K:BB ratio. These are in no way eye-popping or even confidence-inspiring numbers. There is no way that Biddle has "earned" his way to the Big Leagues at this point. However, he has a couple of things in his favor. He is on that 40-man roster already. He is age and level-appropriate for such a promotion. He was a #1 draft pick of the organization. He is a Philly native who would make a nice public relations story, at least for a short time. The likelihood of anyone getting called up from AA Reading is slim. The Fightin' Phils are in the playoffs, which will begin the 2nd week of September. No one is going to be made available from that roster until the final two weeks of the MLB season, if at all. The Phillies are indeed looking at the workload of youngsters Nola, Morgan, and Eickhoff. They are frankly much more likely to try to get through the season mixing that trio with the two vets in Harang and Williams, and subbing in both Gonzalez and Buchanan over the final weeks. With those seven arms the most likely to make up a Phillies rotation in the 2015 season's final month, if you want to look for a dark horse candidate to emerge from among the young guns in the minor leagues, Jesse Biddle might just be the one to actually get that shot. In the 2nd game of their 4-gamer in Miami, the Phillies sent rookie Jerad Eickhoff to the mound. The 24-year old, acquired in last month's Cole Hamels deal with Texas, was the 13th different starting pitcher used by the club in this season of change. He was also the 5th of those to take the hill with their rookie status intact, making their first starts on a big league mound, following the earlier starting debuts of Severino Gonzalez, Phillippe Aumont, Aaron Nola, and Adam Morgan. While those previous rookies have produced mixed results to this point, the performance turned in at Marlins Stadium by Eickhoff (1-0) was anything but mixed. The righthander dazzled from the start, shutting out the Marlins over 6 strong innings. He allowed just 5 hits, striking out 5 and walking just 1 batter. 52 of his 75 pitches went for strikes. The Phils' offense came to life against the Marlins own 23-year old rookie Kendry Flores, who was also making the first start of his MLB career after making a handful of appearances as a reliever this season. Flores (1-2) allowed 5 earned runs on 7 hits while walking a pair of batters. It was the top of the 4th when the offense first got going, as Andres Blanco led off with a double and was singled home by Odubel Herrera to put the Phillies on top 1-0. Ryan Howard followed with a double, and one out later a walk by Flores loaded the bases. A sac fly from Freddy Galvis then made it 2-0, and an error on the play allowed the runners to move up to 2nd and 3rd. That error set up a nice offensive moment for Eickhoff, and the troupe of a couple dozen friends and family members in the Marlins Stadium stands there to witness his MLB debut. Flores intentionally walked Cameron Rupp to re-load the bases, and to get to the rookie hurler. The move backfired for Miami when Eickhoff delivered a 2-run single, pushing the Phillies lead out to 4-0 with his first big league hit. In the top of the 5th, Howard followed a one-out single by Herrera with an RBI double to make it a 5-0 game. In the top of the 6th, with Miami having turned to their bullpen, Galvis led off with a single. Rupp followed him with another single, and when the ball ticked off the glove of left fielder Derek Dietrich and rolled away from him, Galvis hustled to 3rd. He then never slowed, as he was sent home by 3rd base coach John Mizerock when the throw came in to 2nd base. That run busted the lead out to 6-0. With Eickhoff finally lifted in the bottom of the 7th, the Fish broke through on a solo home run off the bat of Dietrich against Jeanmar Gomez. That would be all the hosts could muster on the night. The Phillies tacked on a final run in the top of the 9th, as Howard drilled his 3rd double of the night, just the second 3-double game of his storied Phillies career. That wrapped the scoring at 7-1 in favor of the visitors. Per MLB.com, Eickhoff's postgame statements demonstrated his appreciation for the moment. "It's surreal. You grow up dreaming about this, and words can't describe it. There's so many people you meet that help you get here, and it's just a testament to what they do." 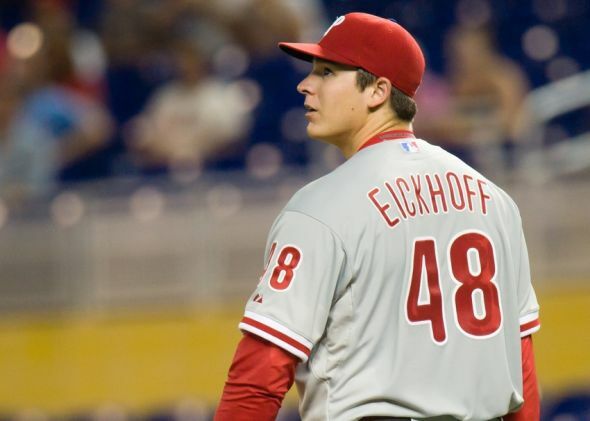 It is expected that Eickhoff will remain a member of the rotation for the balance of the season, joining fellow rookies Nola and Morgan in that role. The trio represent the first wave of a young starting pitcher group that the Phils hope will uncover at least 3-4 long-term gems over the next year or so. Following Wednesday night's victory over the Toronto Blue Jays, longtime Phillies fan favorite Chase Utley walked off the field at Citizens Bank Park for what would turn out to be the final time wearing red pinstripes. Utley tipped his cap to the crowd as he stepped into the dugout, acknowledging the applause, cheers, and even a few tears from those fans, who had been hearing all evening about a pending trade. As the assembled media entered the team locker room, immediate observations were made that Utley's locker was completely cleaned out. Not just mostly cleared for a long weekend road trip to Florida, where the Phillies will take on the Miami Marlins beginning tonight. This was empty, as in "never coming back again" empty. The media was asked to hang around, and about an hour after the game, Utley and GM Ruben Amaro appeared for a relatively brief press conference, during which details of the trade were made available. The Phillies have sent their beloved icon to join another, his longtime double play partner, Jimmy Rollins, with the Los Angeles Dodgers. It will also be a homecoming for Utley, who grew up in Pasadena as a Dodgers fan, and who attended Game 2 of the 1988 World Series between those Dodgers and the Oakland A's with his father as a 9-year old boy. We all know what the Dodgers are getting, one of the greatest and possibly the most beloved player in Philadelphia Phillies history, certainly rivaling that status held previously by Richie Ashburn. What the Phillies are getting in return is modest. A 2-prospect package of IF/OF Darnell Sweeney and pitcher John Richy. Neither is considered a top-tier prospect, which is understandable, considering that Utley is now 36-years old and quite possibly a rental player. Sweeney was the Dodgers 13th rated prospect, according to MLB Pipeline. An infielder/outfielder, the Phils have to hope that he can develop into a genuinely useful backup at the Big League level. The Dodgers 13th round pick in the 2012 MLB Amateur Draft out of the University of Central Florida, Sweeney has risen steadily through the LA farm system over the ensuing 3+ seasons. This year at AAA Oklahoma City, he was hitting for a .271/.332/.409 slash line with 9 homers, 49 RBI, 69 Runs, and 32 steals. Richy was the Dodgers 3rd round choice in the 2014 MLB Amateur Draft out of the University of Nevada-Las Vegas. The 23-year old is a 6'4", 215 lb righty who Fangraphs rated as their #22 prospect back in March, saying that the hope was that he could be a "quick-moving #4 starter type." If he is that for the Phils, they will feel very happy indeed. Sweeney is being promoted by the Phils, and will make his MLB debut at some point this weekend in Miami, likely at 2nd base while Cesar Hernandez sees action at 3rd base. 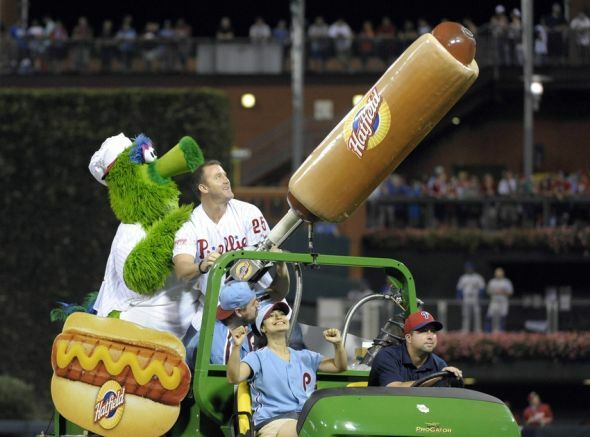 Meanwhile, Utley travels to Houston, where JRoll and the Dodgers will be awaiting him. The Dodgers have a big series with the AL West-leading Astros this weekend in the Lone Star State. They are the "Core Five" of the Philadelphia Phillies run of five consecutive division titles, and the 2008 World Series championship: Ryan Howard, Chase Utley, Jimmy Rollins, Carlos Ruiz, and Cole Hamels. 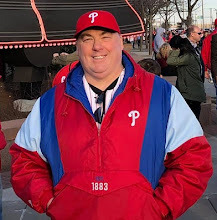 With this evening's revelations of a deal that will send Utley home to southern California for a reunion with JRoll in the LA Dodgers infield, and the recent trade of that 2008 World Series MVP Cole Hamels to Texas, only Howard and Ruiz remain from those great Phillies teams. Where have they gone, those beloved Fightin' Phils who dispatched the Tampa Bay Rays in that cold, wet week back at the end of October in '08? The only key player from that glorious season to actually go out on top was reserve outfielder Geoff Jenkins, whose booming double re-started the decisive Game 5 after two days of rain. Jenkins retired following that Series victory. He was the only one. Backup infielder Eric Bruntlett returned with the Phils for 2009, and then retired. The "33-year old rookie", Chris Coste, returned for '09, moved on to Houston, and finished with his final MLB appearances there in that 2009 campaign. Slugging pinch-hitter Matt Stairs, whose key homer "deep into the night" in LA in the pivotal Game 4 of the 2008 NLCS broke the Dodgers backs that year is now a Phillies broadcaster. He also returned for 2009, and finished up his career playing 2010 with San Diego and 2011 with Washington. Relievers Scott Eyre and Clay Condrey, part of the famed bullpen "Bridge to Lidge", came back for one final year in 2009 and then retired. Chad Durbin, another piece of the "Bridge", returned to the Phils in '09, left for two years, and returned for his final MLB season again in a Phillies uniform in 2013. J.C. Romero, the key lefty setup man for the champs, stayed with the Phils into the 2011 season. He had shots with a couple of teams before finishing 2011 with the Rockies, pitched in 2012 with the Cardinals and Orioles, and then hung up his cleats. 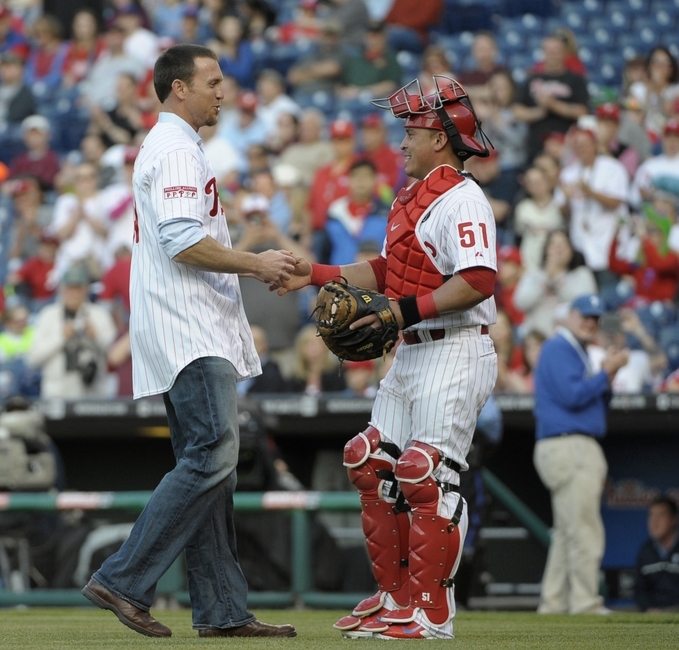 As for Brad Lidge, "Lights Out" himself stayed with the Phillies through the record-breaking 2011 season. He played one final year in Washington before retiring following the 2012 season. Jamie Moyer, who was a Phillies broadcaster during the 2014 season, was with the Phils through 2010, had TJ surgery, made a comeback with Rockies in 2012 at age 49, bounced through a couple other orgs that summer, and then finally hung 'em up. Pedro Feliz remained the Phils' 3rd baseman through the 2009 World Series, then spent one more big league season split between Houston and Saint Louis before retiring. The starting outfield scattered at different times. Left fielder Pat Burrell just last month became the first, and certainly far from the last, to be enshrined on the team's Wall of Fame. Burrell signed as a free agent with the Rays after beating them in the World Series. He then won another Series crown with the Giants in 2010, stayed by the Bay in 2011, and then retired. Jayson Werth cashed in his title and back-to-back Phillies World Series appearances for a $122-million dollar, 7-year deal that has helped make the Washington Nationals relevant. Injury prone in recent years, he is back trying to help the Nats get back to the playoffs at age 36. The Flyin' Hawaiian, Shane Victorino, was dealt away to the Dodgers at the 2012 trade deadline. He signed as a free agent with the Boston Red Sox, and won another World Series in Boston in the 2013 season. The Bosox dealt him to the Angels this season, and he is there now at age 34. Brett Myers was a Phillie from 2002-09. 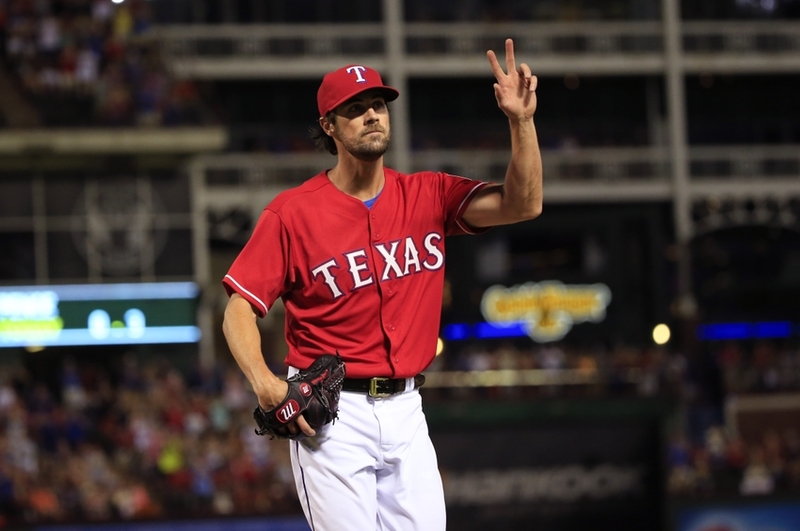 He then had two mostly successful seasons as a starter and one as a closer with the Houston Astros, finished 2012 in the White Sox pen, before finishing his MLB career at just age 32 by making a handful of appearances with the 2013 Cleveland Indians. He is now launching a country singing career, of all things. Kyle Kendrick was a regular member of the 2008 rotation, making 30 starts, but he was shut out of the 2008 postseason entirely. He remained with the Phillies right through last season, and now is with the Colorado Rockies, where at age 30 he has been just awful. Phillies fans who saw it will long remember Joe Blanton's World Series homerun. Blanton was with the club into the 2012 season, was traded to the Dodgers that summer, and then signed for 2013 with the Angels, for whom he was entirely ineffective that year. Out of MLB in 2014, Blanton fought his way back this season. He was solid out of the Royals pen, and has now resurfaced with Pittsburgh, trying to help the Pirates back to the postseason at age 34. You know the rest of the stories, those of that "Core Five": Jimmy dealt away back in December to the Dodgers, Cole a few weeks ago to the Rangers, and now Chase also out to wear Dodger blue. That leaves 'Chooch' and 'The Big Piece' with only each other, the only two Phillies players who stormed the mound after Lidge struck out Eric Hinske. Ruiz was the first to reach his pitcher, with the two men embracing on their knees. Howard was next, plowing them like an NFL linebacker before the trio was buried under a mob of celebratory teammates. Howard is now the longest-tenured professional athlete in Philadelphia. He was first called up in September of 2004, and has become the 2nd greatest homerun hitter in Phillies history, winning an NL MVP and Rookie of the Year Award, and an NLCS MVP as well. He has a $25 million contract guarantee for the 2016 season, and then a likely $10 million buyout. Ruiz got his call in May of 2006, becoming the starting catcher by the following season. He was a 2012 NL All-Star, and received MVP votes every year between 2010-12, handling one of the greatest groups of pitchers in the history of the game during the record-setting 2011 campaign. He has an $8.5 million contract guarantee for the 2016 season, and then a half-mill buyout. "And then there were two." It was the statement made by Howard in the locker room following tonight's victory over the Toronto Blue Jays, as the Utley deal was all but announced as final. Those two, Howard and Ruiz, may be back for one more go around in 2016. Or one or the other, or both, could simply be released this off-season, with the team eating their contracts. But their time is coming, as Phillies fans will reach the inevitable day where all of the 2008 heroes will be gone, as Chase Utley is now gone.